Created shortly after Miró first included words in his art, this painting's subject originated in a sketch by the artist depicting a Catalan folk tale. The sketch (complete with cartoon word-balloons) shows a dog yelping "bow wow" at the moon, while the moon looks down without pity, saying, "You know, I don't give a damn." At once engaging and perplexing, Joan Miró's Dog Barking at the Moon exemplifies the Spanish artist's sophisticated blend of pictorial wit and abstraction. Like many of the works that the artist painted in Paris, this piece registers Miró's memories of his native Catalan landscape, which remained the emotional center and source of his imagery for much of his life. The work's genesis can be found in a preparatory sketch showing the moon rejecting a dog's plaintive yelps with the phrase "You know, I don't give a damn," written in Catalan. Although these words were excluded from the finished painting, their meaning is conveyed through the vacant space between the few pictorial elements that compose this stark yet whimsical image of frustrated longing and nocturnal isolation. Against the simple background of the brown earth and black night sky, Miró has painted a colorful dog and moon, and a ladder that stretches across the meandering horizon line and recedes into the sky, perhaps suggesting the dream of escape. This remarkable combination of earthiness, mysticism, and humor marks Miró's successful merging of international artistic preoccupations with an emphatically regional outlook to arrive at his distinctively personal and deeply poetic sensibility. Michael R. Taylor, from Masterpieces from the Philadelphia Museum of Art: Impressionism and Modern Art (2007), p. 180. At once engaging and perplexing, Joan Miró's Dog Barking at the Moon exemplifies his blend of sophisticated and enigmatic pictorial wit. 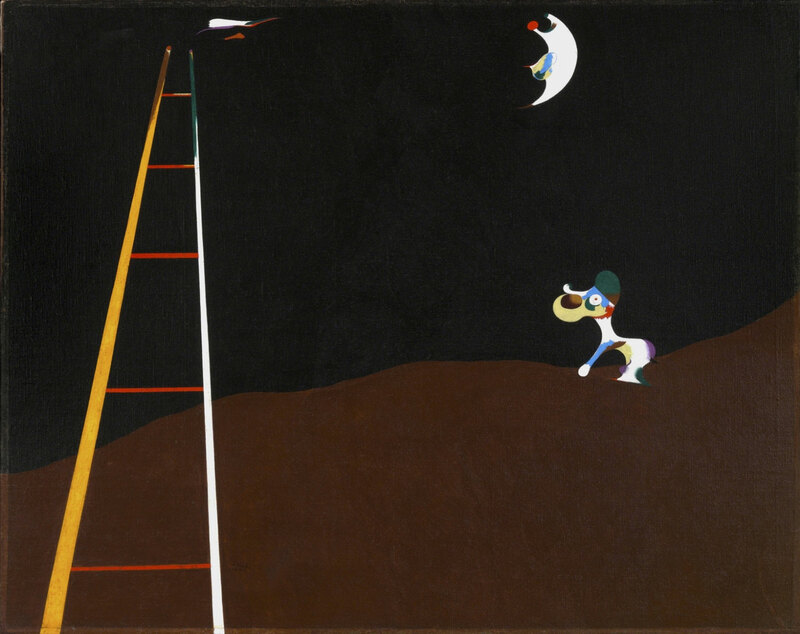 In a sparse and stylized nighttime farm scene, the familiar elements of dog, moon, and ladder are endowed with intensified significance by their distortion and stark isolation against the balanced realms of earth and sky. Miró painted this work during a critical stage in his development, and one richly represented in the Museum's collection. During the 1920s and 1930s, he forged his mature style out of his contacts with Cubism and Surrealism in Paris, tempered by his allegiance to his roots in Catalonia, that distinctive province of Spain. In Dog Barking at the Moon, the precision of its structure owes much to the disciplined geometry of Cubism. Surrealism provided a liberating counterexample, with its inventive freedom born of memory, association, fantasy, and chance, while the energetic primitivism of Miró's Catalan heritage exerted an equally strong pull. John B. Ravenal, from Philadelphia Museum of Art: Handbook of the Collections (1995), p. 321. From a seemingly quotidian subject—a dog barking at the moon—Miró crafted a painting that is fanciful, nostalgic, and replete with metaphysical yearning. As is true of many of the works he painted when he was living intermittently in France and in his native Spain, this work registers memories of the Catalonian landscape, which remained the emotional center of his painting and the source of his imagery for much of his life. Created shortly after Miró first included words in his art in what he called "painting-poems," its genesis lies in a sketch by the artist showing the moon rejecting a dog's plaintive yelps, saying in Catalan, "You know, I don't give a damn." The import of these words, crossed out in the drawing and then excluded from the painting, nonetheless lingers in the vacant space between the few pictorial elements that compose this stark yet whimsical image of frustrated longing. Against the simple background, the artist has painted a dog, ladder, moon, and bird. These brightly painted signs arrayed across the field have the quality of words on a blank page. The ladder receding into the sky lends a sense of deep, vacant space to this scene of nocturnal isolation. Stretching across the meandering horizon line and into the distance, this frequently repeated element of the artist's personal iconography suggests the dream of escape or else a poignant desire for connection between the terrestrial and the cosmic. The remarkable combination of earthiness, mysticism, and humor with a rigorous formal imagination marked Miró's successful merging of international artistic preoccupations with an emphatically regional outlook to arrive at his distinctively personal and deeply poetic sensibility. Twentieth Century Painting and Sculpture in the Philadelphia Museum of Art (2000), p. 63.